It’s Father’s Day weekend, there’s a pricey Pixar Pier premiere, and World of Color returns! Read on to find out about these and more in this week’s Disneyland preview. The Pixar Pier construction is almost done! In fact, there will be a special, hard-ticket premiere Friday, June 22 from 3 to 10 p.m., with it opening to the general public the following day. Don’t have tickets yet? They are $299 each (!!!! ), are still available as this goes to press, and can be purchased here. 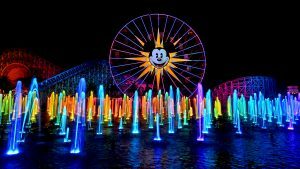 World of Color will also be back starting on Friday, June 22, joining Paint the Night in the evenings at Disney’s California Adventure. Want to check out the new Lamplight Lounge at the entrance to Pixar Pier? You can’t go until next week, but reservations are now available online or by calling (714) 781-DINE for those that want to plan ahead. 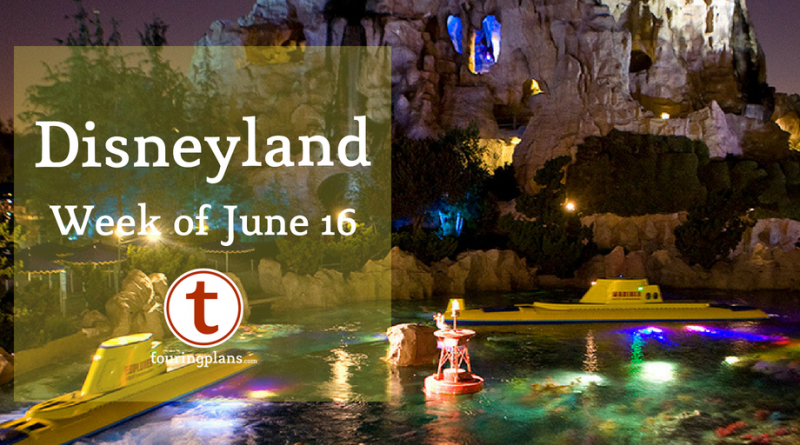 Sunday is Father’s Day, and what better way to celebrate the day than a visit to Disneyland! 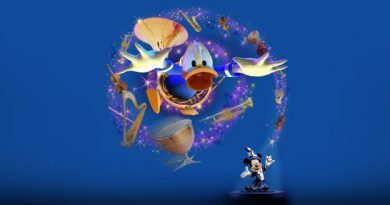 While nothing official has been announced, it’s very common for Disney to have special menus, treats, and merchandise for the occasion, so keep your eyes open for any unique opportunities. Doctor Strange is now appearing for the first time at Disneyland, joining other Marvel characters in Hollywood Land to meet guests at Disney’s California Adventure. be on the lookout for him! I know I’ve been talking about Pixar Fest for a while, but it’s just starting to ramp up as we approach the opening of Pixar Pier. During this festival, which runs through September 3, you’ll find Pixar-themed fireworks and the Pixar Play Parade at Disneyland Park, and the return of Paint the Night at Disney California Adventure, though you’ll also encounter other Pixar-focused activities and opportunities. There will also be special dining opportunities available, as one would expect, and the Alien Pizza Planet is open at Disneyland Park for the occasion. Make sure you check out Rikki’s preview of the Festival! 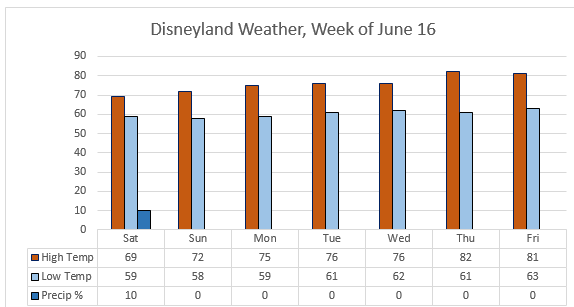 As we continue our march into summer and we see more weekend passholder blockouts, the middle part of the week gets busier. 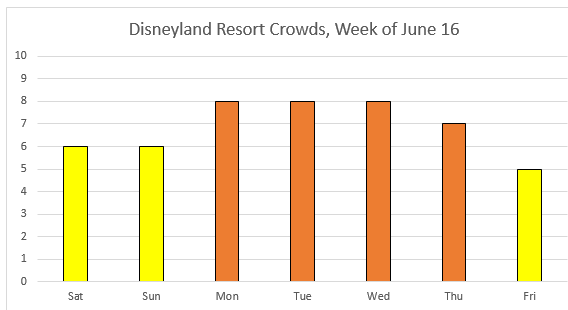 This week, we’re predicting the biggest crowds Monday through Thursday, with the weekends relatively lower. The early part of the week is a respite of sorts, with highs in the low 70s and even upper 60s! Only a hint of a chance of rain on Saturday, with the forecast otherwise clear. Should be another great week in Southern California! Disneyland has a special slate of shows running for a bit for Pixar Fest, with the evening fireworks at Disneyland Park being replaced by Together Forever – A Pixar Nighttime Spectacular (featuring a flying Buzz Lightyear!) and the Paint the Night parade reappearing at DCA. Also, the Pixar Play Parade joins the daytime schedule at Disneyland Park. Fantasmic! will continue to run, with two shows nightly all week. Finally, World of Color is returning this Friday at California Adventure. Detailed show schedules, including smaller diversions like Jambalaya Jazz, can be found here. Passholder blackouts aren’t terrible this week. Southern California Select Passholders are blocked out Saturday, Sunday, Thursday, and Friday, but all other passes are honored every day this week. For those of you buying tickets as day guests, single-day tickets are at Peak price ($135/$127) Saturday, Sunday, and Fri day, and Regular price ($117/$110) the remainder of the week. By the end of the week, pretty much everything will be up and running. Over at California Adventure, the Boardwalk Games at Paradise Pier, Carousel, and Pixar Pal-A-Round (f/k/a Mickey’s Fun Wheel) remain closed during the area’s conversion to Pixar Pier, but those attractions, along with World of Color, return on June 22 (with the Pixar Pier attractions open only for a private event on Friday — the public gets to see it a week from Saturday). With that said, refurbishments can pop up unexpectedly, so check out our refurbishments page for details on exactly what will be down and for how long.